Boy meets girl, boy loves girl, boy marries girl, girl supports boy, girl dies. As straightforward as romantic tragedies get, Love Story is exactly what is says on the tin: a doomed love story, manufactured with the sole purpose of crashing a happy union onto the rocks of the ultimate calamity. Based on the best-selling book by Erich Segal, who also wrote the script, the story struck a chord and the movie became a cultural phenomenon. Oliver Barrett (Ryan O'Neal), a rich Harvard graduate and feisty hockey player on his way to law school, meets Jennifer Cavalleri (Ali MacGraw), a spirited Radcliffe College music student. She is vivacious, artsy, and has a sharp wit that turns every conversation into a jousting match. Jenny's social background is several steps lower than the snooty Harvard class that Oliver belongs to, but this does not stop them from falling madly in love. Oliver has a dysfunctional relationship with his stern father (Ray Milland), and Oliver's romance with Jenny does not help matters: Oliver's parents perceive her to be beneath them. Oliver becomes completely estranged from his father, and goes ahead and marries Jenny. As Oliver goes through law school, Jenny works as a teacher to support them. He graduates and takes a position with a prestigious New York law firm. All seems to be going well and they plan on starting a family, until Jenny is diagnosed with a fatal disease (likely cancer, although this is never mentioned in the film): she has very little time left to live. 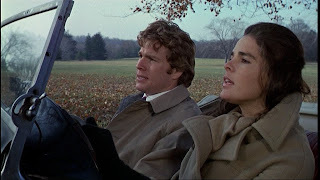 Love Story has some points of irritation: for all her fresh-faced appeal Ali MacGraw's performance is almost theatrical in its grandiose delivery of every line; the famous musical love theme is over-used to distraction in the second half of the film; and Ryan O'Neal's default mode is that of the angry young man, no matter what is going on in his life. And the infamously bad tag line "Love means never having to say you're sorry" has just gotten worse with time. But director Arthur Hiller makes great use of Boston locations, and captures the spark of emerging love in the early scenes between Jenny and Oliver. More admirably, Love Story also takes the time to show the comforts of love and the tenderness between an established couple. A brief sofa scene with Jenny resting on Oliver while they each read a book grasps the essence of couplehood. And the scenes with Oliver's parents are deliciously uncomfortable, resonating with a mountain of never to be resolved issues between Oliver and his Dad. A cultural landmark for better or for worse, Love Story neither over-promises nor under-delivers. It is faithful to all elements necessary to create a heartbreaking romance.